​With the kind of post-bop material that’s easy to listen to but hard to play, these twins have now officially joined the ranks of such historical jazz brother teams with names like Heath, Brecker, Marsalis, Farmer, Montgomery and Mangione. Welcome to the club, boys. The two blossom into a drum and bass team that is almost telepathic. Imagine identical, musically inclined twins growing up in Hong Kong, where they seldom heard jazz, and then at 15 moving with their Japanese mother and American father to musically rich Memphis. 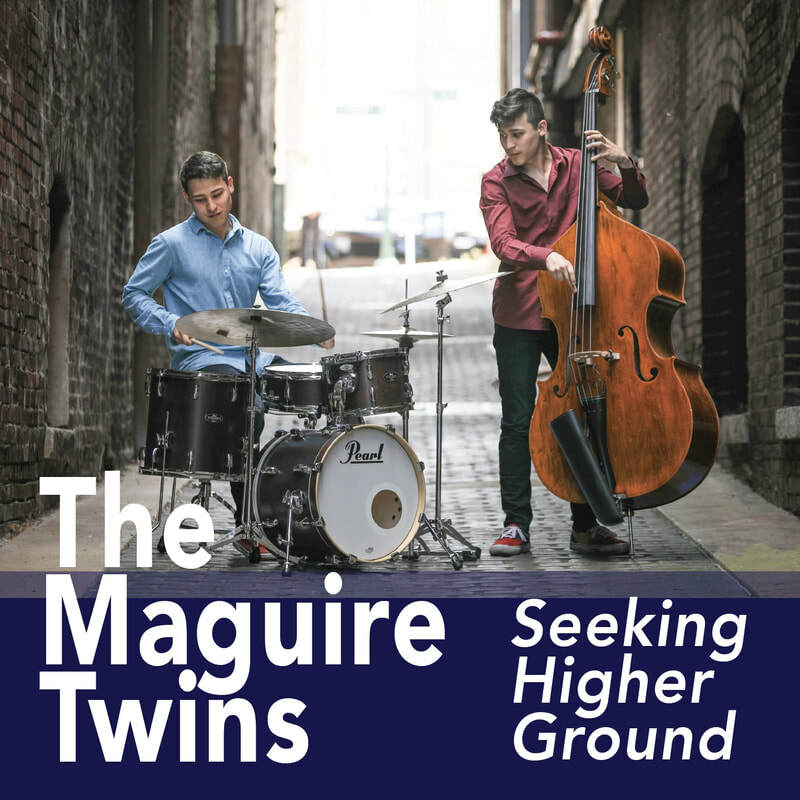 Seeking Higher Ground is a stellar showcase for the Maguires, as both players and composers. They contribute two originals each to the program, which includes songs by their illustrious bandmates and producer. And without sacrificing cohesiveness, the songs are stylistically diverse. “Theodicy,” a timely commentary on misguided religion, is Tardy’s songwriting contribution. He plays tenor with his usual Coltrane-like intensity and, says Carl, “I try to somewhat embody Elvin Jones, who is one of my heroes.” Brown’s tricky “The Early Bird Gets the Short End of the Stick” boasts sudden time shifts and dramatic swoops that both twins laughingly said they were greatly relieved to have handled after numerous attempts. Carl’s “Machi no Michi” (translation: “The Road of the Town”) is an elegant tribute to his Japanese origins, as reflected in the Japanese scale in the bassline and the traditional taiko drum feel in the composer’s playing. “I love the taiko drum’s huge sound and the commanding way it is played,” says Carl, who tunes his snares tightly to highlight the melody. “I used to have a more resounding sound, but I love this kind of playing,” says the drummer, whose curlicued press rolls are his calling card. “It’s how I hear music. When I”m playing I'm thinking about the melodies going on. That’s the way Eric Harland and Kendrick Scott and Marcus Gilmore play,” he adds, naming three of his foremost contemporary influences. And then there’s Alan’s “Witch,” the album’s riskiest piece, which was inspired in part by the eerie 2015 film, The Witch. The open tune features Tardy playing jittery lines behind Mobley’s beautiful, austere phrasing, free-jazzish harmonies, and subtle Cuban accents. Goldberg’s composition, “Shed,” one of the highlights on Seeking Higher Ground, was the first modern jazz tune the Maguires learned how to play. They heard the pianist play it as a sideman on saxophonist Walter Smith III’s Live in Paris and on Goldberg’s own album, Home. “It has been one of our favorites for the longest time,” says Carl. “Just watching Aaron count off his tunes helped me internalize time, made my time stronger,” says Alan, whose role models on bass include Ray Brown (known as “Father Time”), Ron Carter, and Christian McBride. The composing and piano playing of another gifted Aaron—Parks—figured into Alan’s offbeat arrangement of “Someday My Prince Will Come,” which closes Seeking Higher Ground. Alan cited Parks’s “Chronos,” written for and recorded with the supergroup James Farm, as a strong influence. The repeated single note played over many bars by Goldberg lends a haunting minimalist effect. Carl Seitaro Maguire and Alan Shutaro Maguire were born on March 19, 1996 in Tokyo, Japan. The family moved to Hong Kong when the twins were three. They learned to improvise listening to musicians at jazz clubs. “The music just took us over,” says Carl. “When I heard a bassist, I would tell Alan about it. When he heard a drummer, he would make suggestions to me based on what he saw and heard. We helped each other out. Produced by Brown and featuring Whalum, trumpeter/flugelhornist Tom Williams, and pianist Keith Brown, Donald’s son, it showcases the Maguires on material ranging from jazz standards like “Speak Low” to the Broadway-derived title track to “Hamabe no Uta,” a popular early-20th-century Japanese tune translated into jazz. They pay homage to the Blue Note great on the bop vehicle, “Mid Air,” which Carl co-wrote with Ben Flint, a teacher of his. It’s Hendersonian through and through. Oddly enough, the Maguires are not the only bass and drum pairing who are identical twins. The exceptional, French-born François and Louis Moutin are charter members of that club. You would expect Carl and Alan to enjoy a special connection on the bandstand, the way twins do in life, but they were less interested in discussing possible extrasensory ties than the benefits of their shared experience.